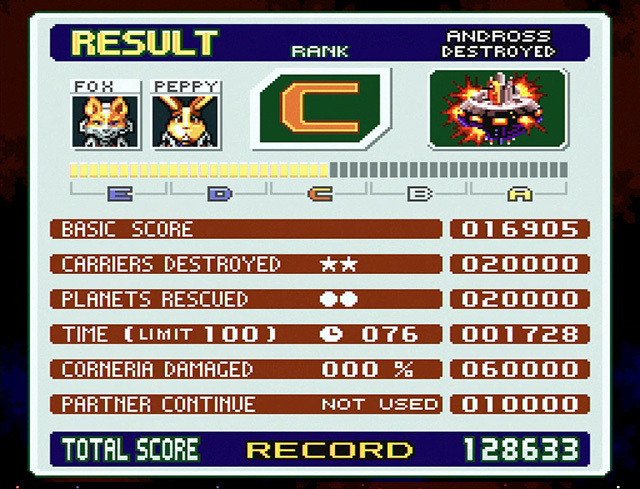 If Corneria is attacked while you are in battle view, its level of damage will be displayed and you will receive a communication from General Pepper. 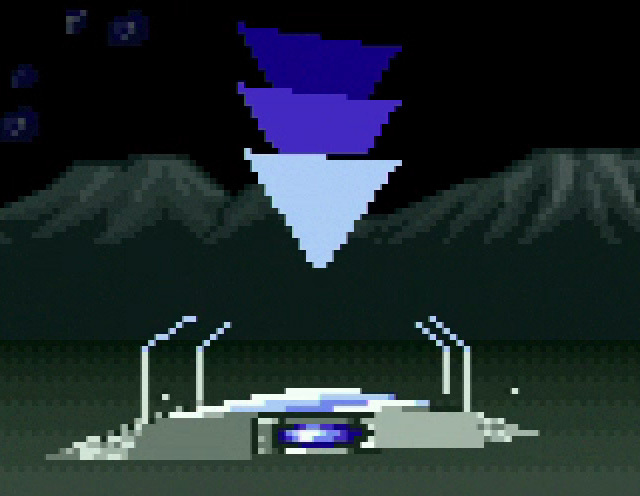 To decide whether to go the planet's aid, press the START Button to open the pause menu. 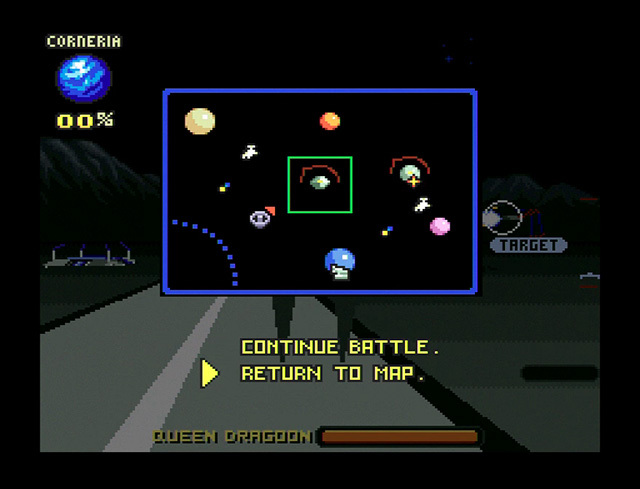 On the pause menu you can view a mini-map of the Lylat system. Time does not pass while you're on this screen, so take your time to assess the situation. If you choose to go and help Corneria, select "RETURN TO MAP" to go back to the map screen. · If you return to the map screen, your progress through the area you were in will be lost. On the pause menu you also have the option to switch your viewpoint (only possible in space). The tip of the arrow points in the direction you are facing. An enemy, an enemy projectile or similar. An enemy base on a planet. A vessel or similar object related to a mission objective. Red, yellow and green dots change in appearance to indicate the relative altitude of targets to your Arwing. The radar scale adjusts automatically according to the distance between your vessel and the target. The radar doesn't just show the location of objects - it also shows the path through enemy bases and other places where the route might not be immediately apparent. In space the target shown will be the enemy closest to you. 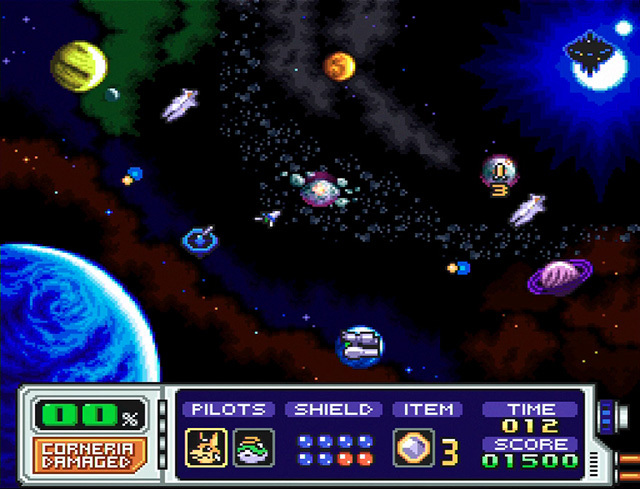 On planets, targets shown will be things like switches and enemies guarding switches. 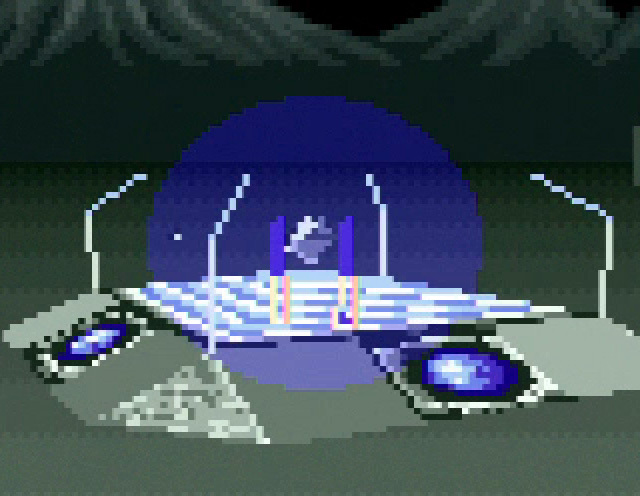 If Corneria sustains 100% damage it will be destroyed, and the game will end. If your Arwing is destroyed you can continue as your wingman, but if that craft is also destroyed it's game over. 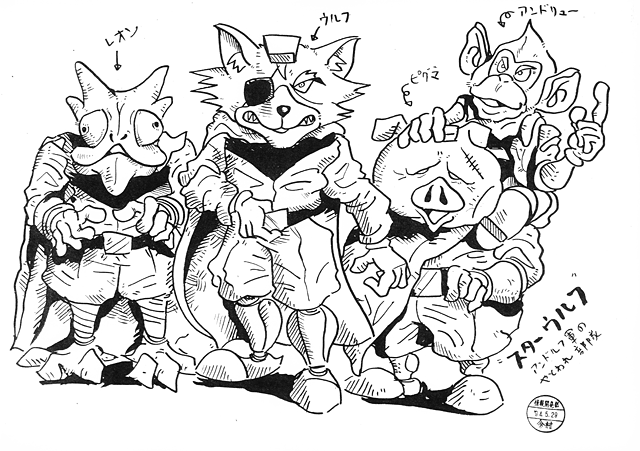 Be sure you can get back to Corneria in time to defend it if you're heading to remote areas. When the game ends, your results will be displayed. Your rank is influenced by various factors like number of enemies defeated and time taken. For example, the longer you take, the lower your rank is likely to be. 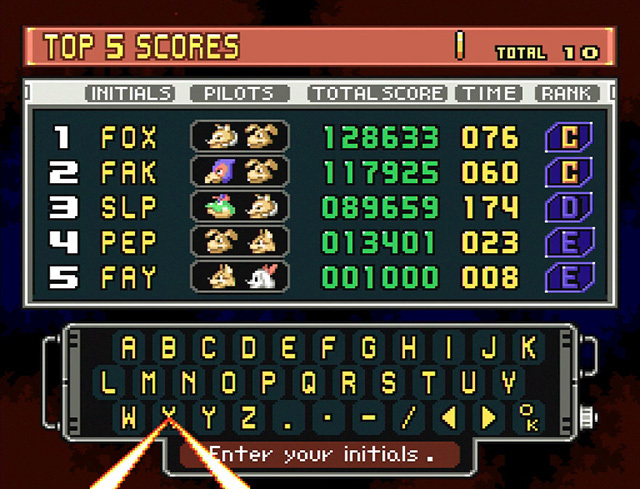 If your score is in the top five, you can save it to the records. Use the +Control Pad and the B Button to input your initials (up to three characters) and confirm by selecting "OK". 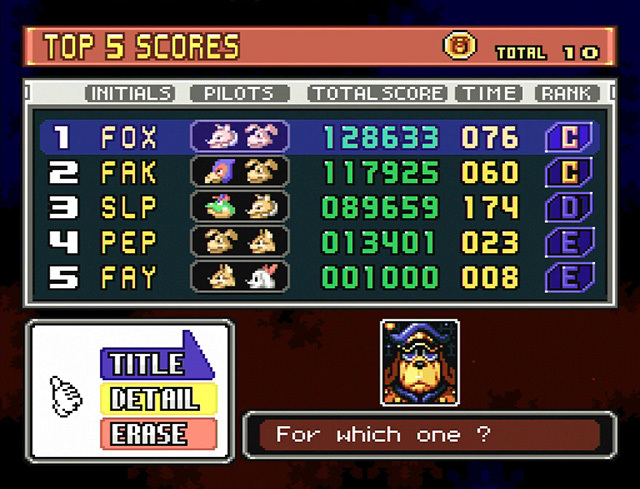 You can view these top five scores by selecting "RECORD" from the title screen. To see the results screen for the game related to a particular record, select that record and then "DETAIL". · All records can be deleted by selecting "ERASE" then "YES". 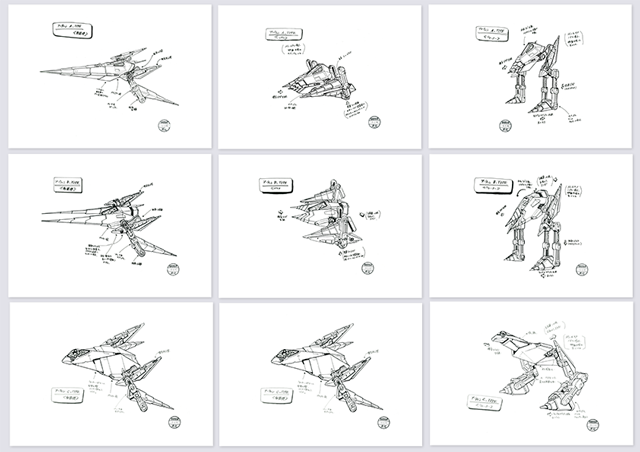 Some more hand-drawn treasures from the early days of the game's development! Why not download them to your phone to peruse at your leisure, or print one out to colour in and use as a poster?